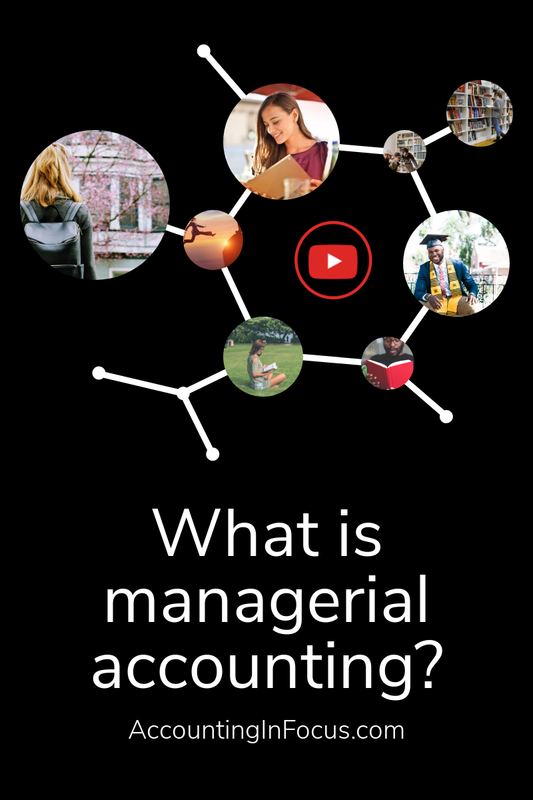 » What is managerial accounting? 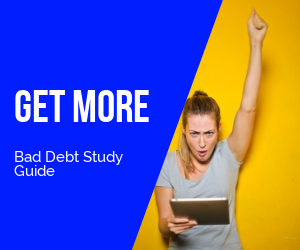 After taking financial accounting, many students dread the idea of another semester of journal entries, debits, and credit. To avoid this dread, check out our topics on financial accounting or all of our accounting topics. Fortunately, managerial accounting is very different from financial accounting. 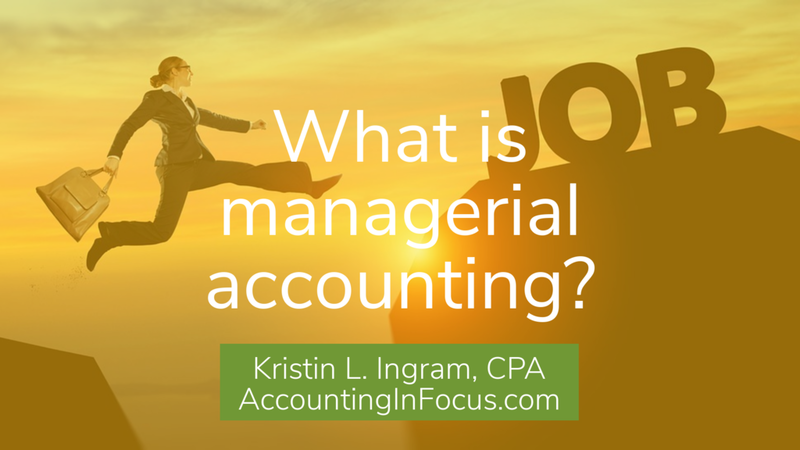 I have had a number of students in the past who hated financial accounting but really liked managerial accounting. Typically, most non-accounting majors feel that managerial accounting is more relevant to their field. I hope that you will give managerial accounting some time before you make a judgment on the subject. 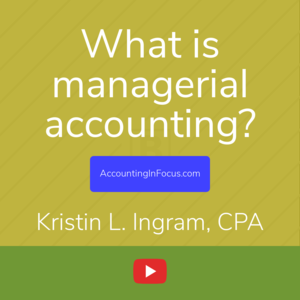 There are a number of ways in which managerial accounting differs from financial accounting. Let’s look at some of them here. Who are the users of managerial accounting information? Unlike financial accounting which is designed for external users, managerial accounting is focused on internal managers. Managerial accounting is designed to help managers plan for the future, make decisions for the company, and see if their plans and decisions were accurate (also called controlling). Who makes the rules in managerial accounting? In financial accounting, the rules are set by the Financial Accounting Standards Board (FASB) or by the International Accounting Standards Board (IASB). The standards set by FASB are collectively called GAAP (Generally Accepted Accounting Principles) and the standards set by the IASB are collectively called IFRS (International Financial Reporting Standards). These rules must be followed when companies are filing reports for external users. Because the reports generated are for internal management, there are no reporting rules in managerial accounting. In this course, we discuss best practices for obtaining the information that managers need to plan and make decisions. There is no external body that states what our managerial reports must look like. This also means that managerial accounting is not as simple as learning the income statement, statement of stockholder’s equity, balance sheet and statement of cash flows (maybe easy was the wrong word here). In managerial accounting, if you can come up with something you want to measure, we can usually create a report for it. That means that the possibilities are almost endless. Want an analysis of future marketing costs and projected return on investment? We can do that. Want to know if we should continue to make our product by hand or automate the process? Yup, we can do that, too. That’s one of the things I love about managerial accounting. It takes a lot more thought and creativity than financial accounting. Financial accounting requires us to look at each company as a whole. Many companies are made up of a number of different brands but all of those brands are reported together in one set of financial statements. Think of a company like GAP. GAP not only owns all the GAP branded stores, but also Banana Republic, Old Navy, Piperlime, Athleta, and Intermix. All of these brands are lumped together into a single set of financial statements. If a manager can define a segment and believes that the information will be useful in planning, decision making, or controlling, reports can be generated for that segment. Financial accounting is all about historical information. In the financial statements, we are reporting things that have already happened. Since managerial accounting deals mainly with planning and decision making, we are looking into the future and trying to predict what will happen based on historical trends. We are always looking for the most up-to-date information to use in these tasks. Managerial accountants are more focused on relevant information, where financial accountants are required to ensure that information is reliable and objective. In order to make decisions in a timely manner, managers must be able to gather information quickly. Financial accounting dictates that reports are created quarterly and annually. Because managerial accounting reports are created for planning, decision making, and controlling, reports are created whenever these functions need to take place. Many financial reports are created on a daily basis as part of the controlling function. Other reports are only created once in order to aid in the decision-making process. Budgeting reports can be created monthly, quarterly, or annually based on need. There are no frequency requirements in managerial accounting. Reports are created as needed to fulfill management needs. As you can see, managerial accounting is very different from financial accounting. As you progress through your managerial accounting course, the differences will become more clear. However, I believe that the way you study for managerial accounting is similar to the successful study habits for financial accounting. 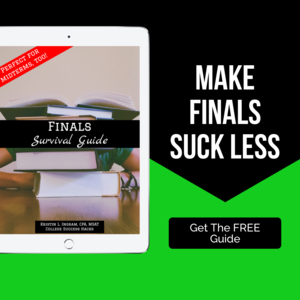 Yes, there are a lot of numbers and equations in managerial accounting but you can actually make it through the course without knowing a single formula. Focus on the concepts in the course. Link those concepts to the way business actually operates. When you think of these concepts in terms of the processes that are going on in the business, the numbers are easy to calculate. As I write the material for this course, I will always discuss the processes to help you get around learning the formulas but I will list the formulas as well. It is my hope that as your understanding of the concepts increases, your reliance on the formulas will decrease. Managerial accounting uses basic math just like financial accounting. If you can add, subtract, multiply, and divide, you have all the math skills needed for this course. Don’t get overwhelmed by all the numbers. Focus on the concepts and the numbers are not difficult. This may be the most important piece of advice I can give you. Label all of your numbers. If something is expressed in dollars, label it as dollars. If something is expressed in machine hours, label it. If you $100,000 and divide it by 25,000 machine hours, your answer will be $4/machine hour. This will be very useful as you try to apply this number to other parts of a problem. Get in the habit of labeling all of your numbers early. This will save you a lot of time and confusion as you progress through the course. 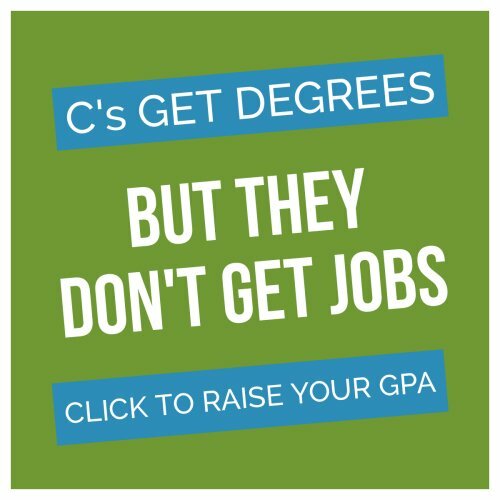 Maybe you have been out of college for years, or you do just what it takes to get by. 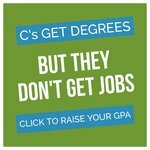 STOP according to a recent study the average student with a GPA of 3.8 or higher makes 78% more money after 3 years of work. If you want to work in your field, you can learn to learn better, that is why this to help students have the sign up for my free training and have the best semester ever so when you earn your degree you can earn more money. Previous Post 3 Types of Companies in Managerial Accounting Next Post What is managerial accounting?